Thunder Bay, ON (Apr. 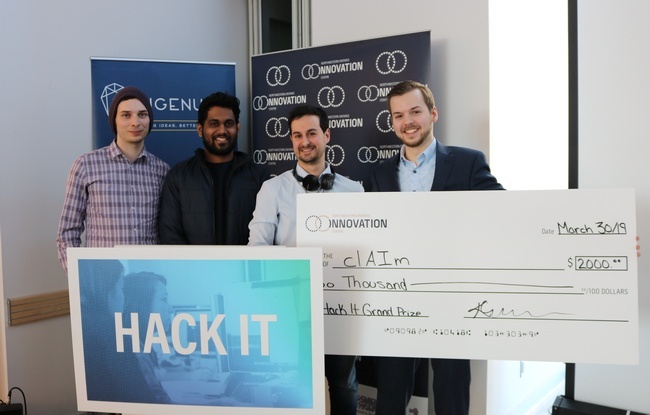 4, 2019) – Hack IT, Northwestern Ontario’s first InsurTech hackathon, was held last week (March 29-30) at Ingenuity, Lakehead University’s student business incubator hub, in Thunder Bay. Organized by the Northwestern Ontario Innovation Centre, Lakehead University and local insurance brokerage Jones & Associates Insurance, the 24-hour event focused on technological innovation in the insurance industry. Ten teams comprised of students and alumni from Lakehead University and Confederation College worked together to brainstorm and develop new insights and solutions to insurance-related issues. Themes examined included changing demographics, severe weather events, the sharing/gig economy and new trends such as cybersecurity and increasing costs associated with insurance fraud. At the end of the 24-hour hackathon, all 10 teams presented their ideas to a panel of judges and three were awarded cash prizes. The winning team came up with a solution that tackled fraudulent claim reporting using AI, the runner-up pitched a mobile app to incent improved driving performance and address retention rates, and the bonus prize winners proposed a way to address commercial fleet risk profiles through telematics. Amongst the other groups, there were a number of unique ideas that stood out and Hack IT mentors deemed worthy of further investigation. These included a method to assist diabetes patients in providing health monitoring information to carriers with the goal to improve insurance availability and another solution that used AI to help prospective homeowners assess important risks to value a home. “We are very pleased that this event was able to provide value to our students and look forward to working with the insurance industry partners we had here to develop future research and innovation initiatives for Lakehead University students,” stated Dr. Mike Dohan, Director of Lakehead University’s Centre for Innovation and Entrepreneurship. † Learn more about InsurTech participants BobTrak, BrokerLift and ClientDesk – and others – at InsurTech Spotlight. Organized by Jones & Associates Insurance, the Northwestern Ontario Innovation Centre, and Lakehead University, the 24-hour hackathon focused on technological innovation in the insurance industry. During Hack IT, teams of students and alumni from Lakehead University and Confederation College worked together to brainstorm and develop new insights and solutions to insurance-related issues. Industry partners including Gore Mutual Insurance, Policy Works, BoBTrak, BrokerLift and ClientDesk also participated in Hack IT to provide insight and guidance throughout the hackathon.